iSolved’s® human capital management technology includes integrated Human Resources software that enables workflow, letting you input, store and report all types of employee data. You can manage and strengthen your talent with highly configurable reporting and multi-level performance management capabilities, easily pull compliance reports or perform multi-level performance reviews (peer to peer, direct reports, etc.). iSolved® technology is the answer for all of your HR needs. 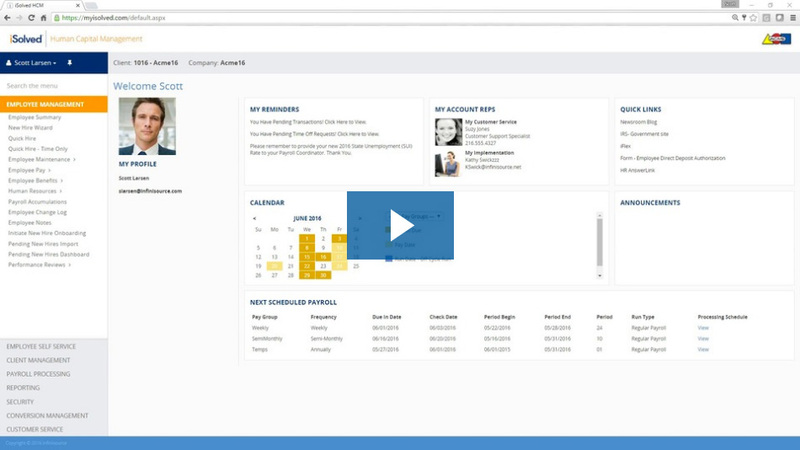 iSolved helps you streamline and manage all your HR needs. With iSolved Human resources, you can handle everything from hire to retire! Whatever your HR needs are, iSolved technology can improve your workforce management processes. Call us today (866) 992-5205, or use our online contact form below, to learn more about iSolved® and how it can improve your Human Resources processes.